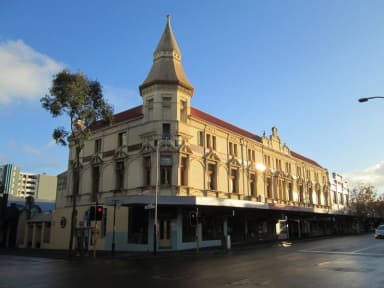 It’s located in a beautiful old building in the popular inner suburb of Northbridge where you can find many restaurants, nightclubs, cafes and retail shops near by. You can either relax in our TV Room where we offer a long list of movies or have fun playing some board games. You can make use of our large dining area and kitchen where you can meet other travellers and mingle with other guests in our open courtyard, which has a pool table and a BBQ. We provide with laundry facilities (washing machines, dryers) as well as irons and ironing boards. We have a 24-hour reception and vending machines available at all times. If you like taking care of the environment and have a bike, we offer you the possibility to keep it safe at our backyard. Britannia does supply free WiFi to in house guests. Please be aware that passports are required in order to check in. Failure to do so will result in the cancellation of the booking. Beautiful old building located close to attractions and transportation. The best aspect of the hostel is the staff. Good to see the improvements in the last year or so. New flooring plus redecorated rooms and an upgraded courtyard. I had a private room at Britannia, it was nice enough for what you’d expect from a hostel. The WiFi doesn’t work in the rooms or communal areas though (apart from the courtyard out the back) The staff are polite enough but not overly helpful. Decent, basic accommodation in a good location for nightlife. Cheap private room in perfect location. Not cleaned properly (hair everywhere, made the mistake of opening the drawer). No mirror in room, had to buy one. Comfortable bed. Couldn't open window. But the biggest problem was I couldn't get in after being out at night without calling someone to come and let me in, even with my key! What if I had run out of battery or not had a SIM card? Then when I wanted to leave again I COULDN'T - locked in! Also wouldn't let me pay for a late checkout in advance. The staff were super nice. 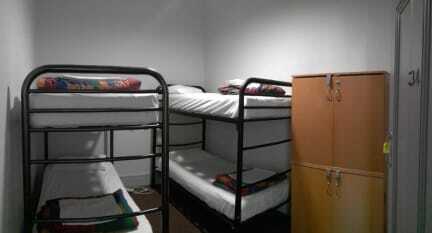 The rooms are quite cramped though and there were only 4 lockers in an 8 bed room which makes no sense. I only saw the bathrooms and the twin bedroom. Rather grubby and some showers and doors/latches broken. I can't comment on the atmosphere as we weren't there long enough to experience it. Staff friendly but average hostel. I have never stayed in a hostel with such a bad cockroach infestation in the kitchen. I understand how hard it is to completely eradicate cockroaches from a building but you are not even trying. You should have a pest control expert in to look at this immediately as it is unhygienic and goes to show how much dirt and grime is in the place. I can also suggest sticky traps throughout the kitchen and paying for a fumigation. There are thousands of them. Extremely small room that had no natural light or ventilation. The room was far too small for 4 people and stifling, bunk beds had no ladder so difficult to climb to top bunk. Kitchen was nice but there was no fridge space. The ‘quiet time’ curfew was not adhered to and therefore it’s was constantly loud at all hours. Location was great, the whole place could do with a general revamping. Staff were nice and helped with issues we had.